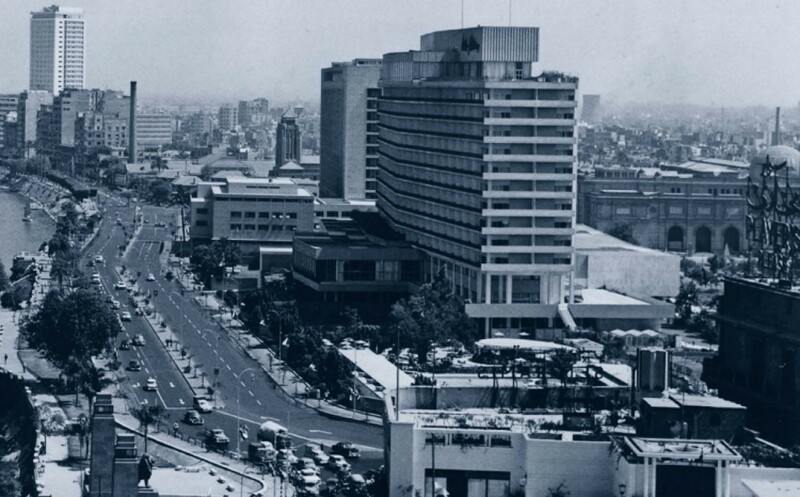 In the epilogue to Grand Hotels of Egypt there’s a photo (detail above, click to enlarge) of the then newly built Nile Hilton in Cairo, taken, I think, some time in the 1960s. Visible behind and to the right of the hotel is the Egyptian Museum with its low-rise neo-classical façade and dome above the entrance hall. Behind and to the left is a less-familiar structure of a square tower with a pyramidical cap; this is the old Anglican Cathedral, long since gone and almost entirely forgotten – at least, I’ve never heard anybody mention it. Which is ironic given that it was one of the few Cairo buildings ever to be designed by an architect of international renown. Adrian Gilbert Scott (1882-1963), who as a major in the Royal Engineers served in the first World War at Gallipoli and in Palestine, winning the Military Cross, was the grandson of Sir George Gilbert Scott (1811-1878), one of the leading English architects of the Victorian age. Sir George designed the Midland Grand Hotel at St Pancras Station, as well as the Albert Memorial and the Foreign and Commonwealth Office, all in London. Adrian’s older brother Sir Giles Gilbert Scott (1880-1960) designed Liverpool’s Anglican Cathedral, Battersea Power Station and Bankside Power Station (now the Tate Modern), both also in London, and Britain’s iconic red telephone box. Adrian assisted his brother on the Liverpool Anglican Cathedral, completed in 1938, and was later appointed to adapt the designs of Sir Edwin Lutyens for a Catholic cathedral in the same city (regarded by some as one of the greatest buildings never built). Lutyens had intended to create a massive structure that would have boasted the second largest dome in the world after St Peter’s in Rome but it proved too expensive and Adrian Gilbert Scott was asked to work on a smaller design, which would have meant he had a hand in two cathedrals in one city. In the event the building didn’t go ahead, but by then he already had a completed cathedral to his own name. The British church in Cairo dates back to the mid 19th century. In 1862 Albert Prince of Wales, later King Edward VII, visited Egypt as a guest of Said Pasha. He earned much admiration by climbing the Great Pyramid unassisted – at the time it was customary to make the ascent with the aid of three locals, two pulling and one pushing. He also attended mass held in a small room at the Coptic Patriarchate, which the English colony in Cairo were allowed to use for their services. On reflection this was seen to be a poor state of affairs, and from then on English services were transferred to Shepheard’s hotel (and, after 1869, also the New Hotel). In 1863, Said was succeeded by Ismail Pasha who agreed to donate land in Boulaq for the site of an English church. It took a while but the church was finally ready for use in 1876. It was later superseded by St Mary’s in Garden City, but that also was soon outgrown. A site for a new cathedral was obtained in July 1928 when the Egyptian government authorised the sale of a plot of land just to the north of the Kasr al-Nil barracks on the east bank of the Nile. 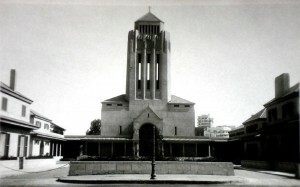 Adrian Gilbert Scott was selected as the architect. He reported, ‘The site is a very fine one and by far the best of the various ones considered. Its frontage to the Nile is a very fine asset while gardens should provide a very peaceful atmosphere rarely obtainable in a town site’. A foundation stone was laid on Friday 20th November 1936 and just 18 months later, on 25th April 1938 (St Marks Day – an appropriate tribute to the acknowledged founder of Christianity in Egypt), in a ceremony attended by the architect, the cathedral was consecrated and dedicated to All Saints. The peaceful atmosphere promised by the site did not last long. The cathedral had been built on the site of a disused lock on the Ismailia Canal, long since filled in but with earth but subject to uneven settlement. By the 1950s cracks had started to show in the building. Relations between Britain and Egypt were strained by first Independence then the Suez affair, and no serious steps could be taken by the Church to make the necessary repairs. Meanwhile a new riverside highway, the Corniche, was created between the river and the cathedral, with all the attendant noise and vibrations. The threat caused by traffic didn’t stop there. Further road-building plans of the Cairo Governorate involved the creation of a Ramses Bridge (since renamed the 6th October Bridge) crossing the Nile at the very site of the cathedral itself. The news was received with shock by the British community in Egypt. There were lengthy negotiations to try to keep the cathedral on its site but it’s not hard to imagine how much satisfaction it must have given the new native rulers of Egypt to brush aside this prominent landmark to the influence of the old colonial masters. The governorate did however provide an alternative location as well as cover the cost of constructing a new church. The deconsecration of Gilbert Scott’s Cairo Anglican Cathedral took place on 10th February 1978, not even 40 years after the opening ceremony. Its replacement began celebrating mass some ten years later on a new site in Zamalek, built on a plot that used to be part of the Gezira Palace gardens. 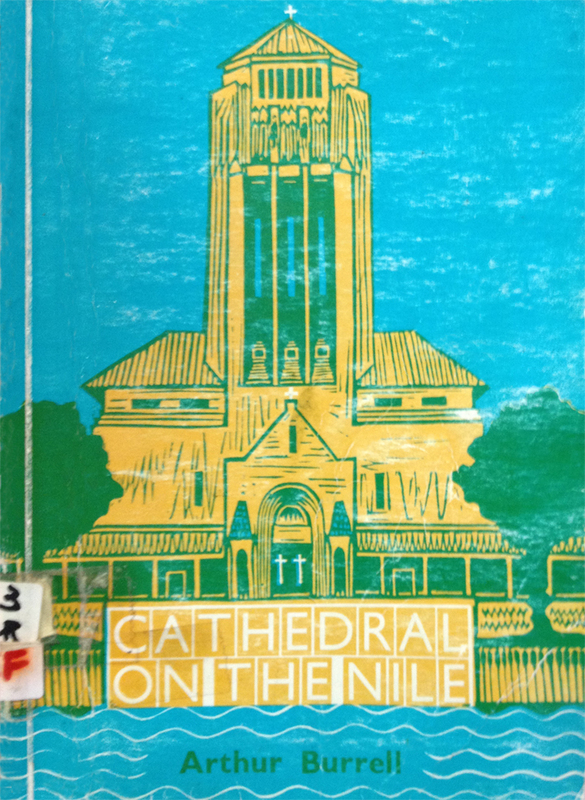 For anyone curious, the library there has a copy of a slim booklet Cathedral on the Nile by Arthur Burrell, which is where most of the history in this post comes from. As I said earlier, the old cathedral is these days largely forgotten. Its ghost lingers on, occasionally to be glimpsed in some old photo, and sometimes also in the strangest of other places. Several years ago I was in Miami and happened to visit the Wolfsonian Museum at the heart of South Beach’s art deco district. 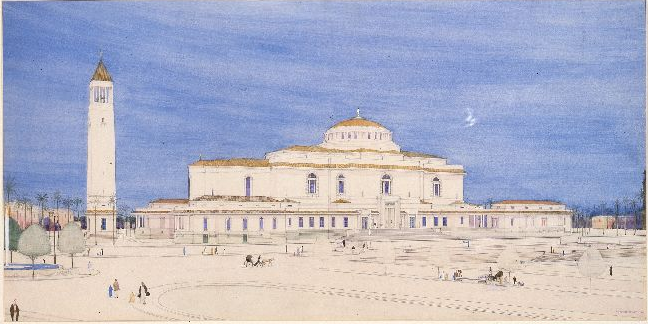 It’s an excellent institution dedicated to art and design, and there on one of its walls was a particularly beautiful large architectural drawing depicting an Eastern church; it was credited to Adrian Gilbert Scott and the label explained it was a design for the Anglican Cathedral in Cairo. It looks nothing like the cathedral as built and I assume it shows an early discarded proposal. Wonderful to discover though that if Gilbert Scott’s fine cathedral is gone from Cairo, it is at least in some small way remembered elsewhere. For more on Cairo’s Anglican Cathedral, past and present, visit the excellent Cairo Observer website. I was both baptised and confirmed in this Anglican Cathedral, Cairo during the 1960s. In addition I sang in the choir, not bad for a young girl; my godmother, Jenny Davison, was conductor. I was intrigued to find this article when revisiting information on Adrian Gilbert Scott. I am a teacher at Farnborough Hill School in Hampshire where the chapel was designed by Adrian Gilbert Scott. The school is a RC girls school, formerly a convent school, and the Gilbert Scott additions are to the Victorian home of the exiled Empress Eugenie, widow of Napoleon III. 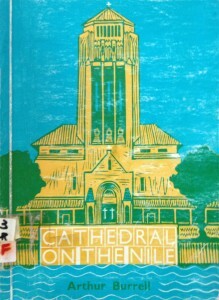 How interesting to find out about ‘The Cathedral on the Nile’. I had for some time been searching for All Saints’ Church in Ismailia, where I was baptised in 1944. I visited Ismailia in May this year (for the first time since my birth) and searched in vain. Now I know that, sadly, it is no longer there. However, at least I now know its history and have a picture of it. Thank you so much. I rented a room at the Cathedral from 1963 to 1965 when Rev Donald Blackburn was Provost, and was married there in December that year. There was an active community, shared between the British expats and the Coptic Protestants, and a small but enthusiastic choir. The choir became very ambitious after the ’67 war with the new embassy intake, especially when an Arabic Scholar and organist spent some time in Cairo and helped move the organ to below the chancel steps. The building, and community, was still there and active in the mid 1970s, though aware that change was imminent. The new bridge was due to take over the Cathedral site and the tram terminal next door, but details hadn’t been finalised. So many more memories to record!